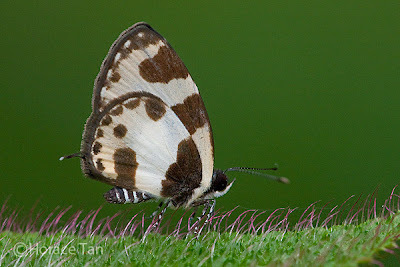 Above, the Elbowed Pierrot is dark brownish black with a broad white band spanning both wings. 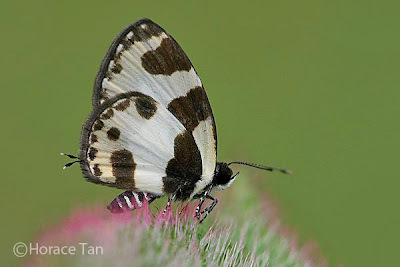 Beneath, the Elbowed Pierrot is yellowish white with a number of black spots and markings. In particular, the basal streak in the forewing is right-angled, and appears to link up with the basal streak in the hindwing. Each hindwing has a slender white-tipped filamentous tail at the end of vein 2. 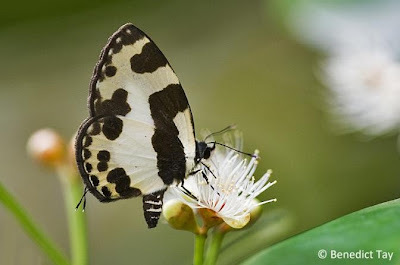 An Elbowed Pierrot visiting flowers in the nature reserve. 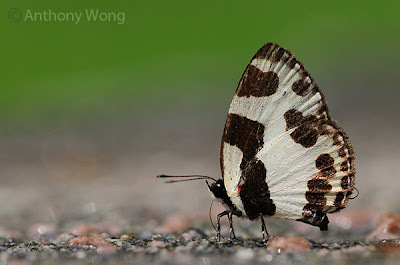 An Elbowed Pierrot puddling on wet grounds. An Elbowed Pierrot resting on a perch. 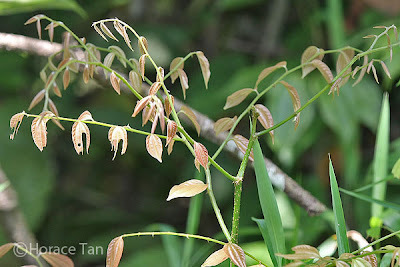 This small-sized species is rather common in the nature reserves of Singapore. The adults are often found flying close to the ground and settled at moist spots on the forest floor. On sunny days, they can be found to visit flowers, and the males have been observed to puddle on bird droppings. The local host plant, a Ziziphus sp., is a thorny straggling shrub with simple, alternate and ovate-lanceolate leaves, each of which has three prominent nerves and finely toothed along the edge. Young leaves are light brown to reddish brown, and turning green when mature. All four instars of the immature stages of the Elbowed Pierrot feed on the young brownish leaves, and the green leaves when they are still relatively young and tender. Host plant:a Ziziphus sp. Young shoots. Host plant: a Ziziphus sp. Close-up shots of young and mature leaves. 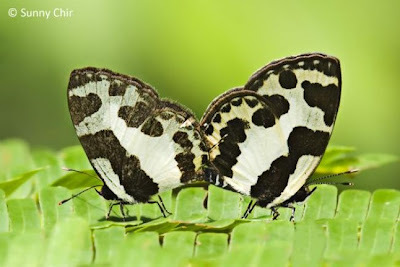 A mating pair of the Elbowed Pierrot. Elbowed Pierrot mothers' attempts to lay eggs on the leaves of the host plant. Eggs of Elbowed Pierrot are typically laid on young shoots or leaves of the host plant. 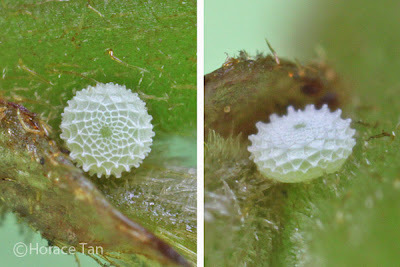 The small egg is disc-like (about 0.5mm in diameter) with a depressed micropylar. When freshly laid, the egg is yellowish green. The color soon decolorizes to light green within the next few hours, and then to white overnight as it matures. The surface is covered with a reticulated pattern of intersecting ridges. Two views of an egg of the Elbowed Pierrot. Diameter: 0.5mm. 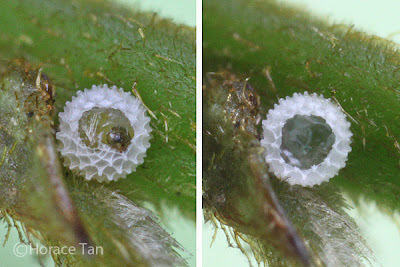 Left: mature egg showing the caterpillar eating away the egg shell for its exit. Each egg takes 2-2.5 days to hatch. The young caterpillar emerges after nibbling away sufficiently large portion of the egg shell. Measured at a length of about 0.9mm, its pale yellow body is cylindrical in shape, sporting long fine setae (hairs) and a brown head capsule. 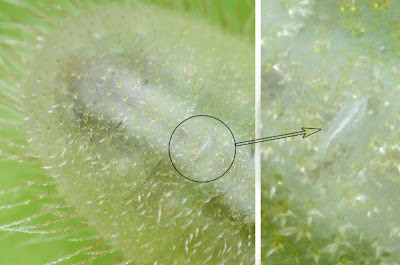 Top: a newly hatched caterpillar, length: 0.9mm. 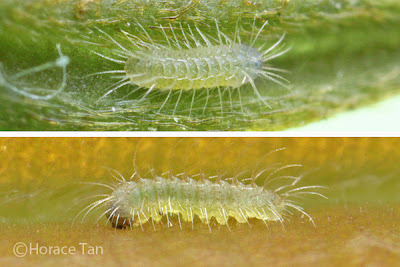 Bottom: 1-day old caterpillar, length: 1.2mm. The newly hatched grazes on the surface of young leaves. As it feeds and grows, its body takes on a greenish undertone. After 2 to 3 days of growth, it looks pumped up at a length of about 2mm. After a period of immobility of about half a day, it moults to the 2nd instar. 1st instar caterpillars. Top: 2-day old, length: 1.5mm. Bottom: late in this stage, length: 2mm. 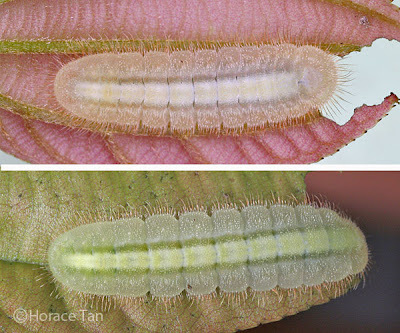 Covered with numerous setae, the body of the 2nd instar caterpillar could in either light yellowish green or pale pinkish coloration. Setae found at the dorsal and lateral margins are longer and stiffer. 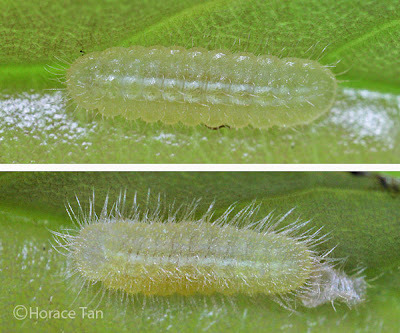 The body is flatter compared to the 1st instar caterpillar, and faint dorsal bands whitish in color are discernible. 2nd instar caterpillars. Top: newly moulted, length:2mm. Bottom:late in this stage, length: 3.5mm. Top: late 2nd instar in pre-moulting dormant state. Bottom: newly moulted 3rd instar caterpillar. 3rd instar caterpillars. Top: early in this stage, length: 4mm. Bottom: late in this stage, length: 6mm. 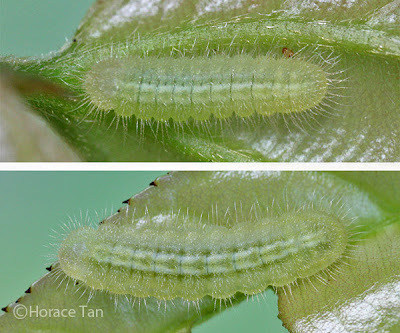 The 4th (and final) instar caterpillar is similar in appearance to the 3rd instar caterpillar with one main difference being the apparent merging of the two dorsal bands into a single broad band. The body segments appear to be translucent, in either light green or pale pinkish coloration. The body shape deviates from the usual onisciform shape in being much flatter with a large prothorax. 4th instar caterpillars. Top: middle-aged, pink form, length: 9.5mm. Bottom: late in this stage, green form, length: 12mm. 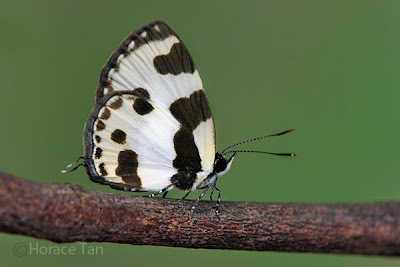 While some members of the Caleta genus (such as Caleta roxus) do not carry any nectary organs in any instar, the Elbowed Pierrot has a slit-like structure on the 7th abdominal segment in the final instar. With no ant attendance observed in the field, it is likely to be a non-functional dorsal nectary organ. In addition, no tentacular organs can be found on the 8th abdominal segment. 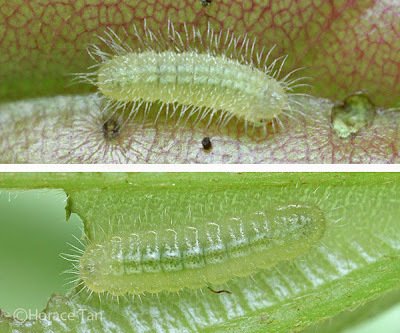 a final instar Elbowed Pierrot caterpillar. 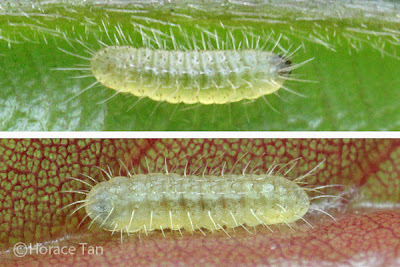 After 5-6 days of growth and reaching a maximum length of around 12-13mm in the final instar, the body of the caterpillar gradually shrinks, and finally takes on a pale reddish brown coloration. 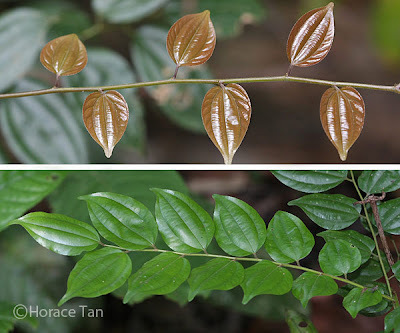 All bred specimens chose to enter their pre-pupatory phase on a spot on the leaf surface. At the chosen site, the caterpillar readies itself for pupation by spinning a silk girdle and a silk pad. The caterpillar secures itself to the silk pad via claspers on its posterior end. Two views of an immobile pre-pupatory larva of the Elbowed Pierrot. Early stages of the Elbowed Pierrot. 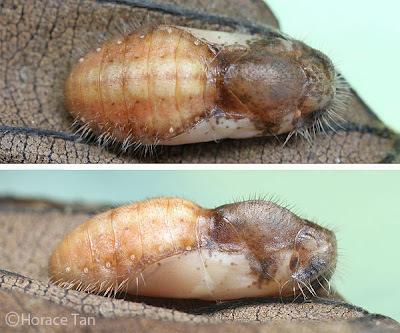 Pupation takes place after one day of the pre-pupal stage. 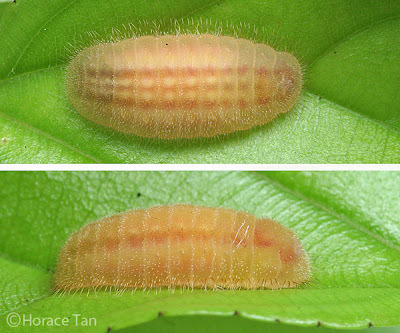 The hairy pupa has the typical lycaenid shape, being somewhat flatter and having a broader abdomen. It is pale brown in the abdomen, dark brown on the thorax and beige in the wing pad areas. The pupa has a length of about 8-9mm. 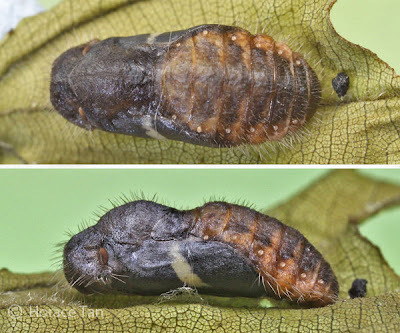 Six days later, the pupa becomes darkened in color signaling the imminent emergence of the adult. The prominent white bands on the forewing uppersides become visible through the pupal skin in the wing pads. The next day the adult butterfly emerges from the mature pupa. 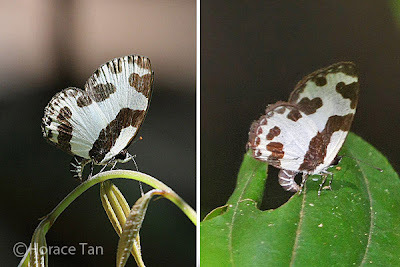 Two views of a mature pupa of the Elbowed Pierrot. 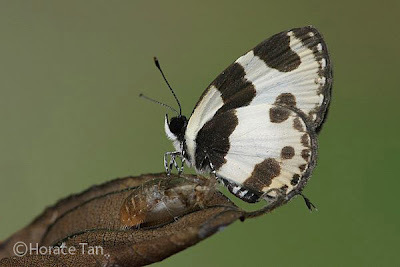 A newly eclosed Elbowed Pierrot perching near its empty pupal case. The life history of Caleta roxus, Konrad Fiedler, Nachr. entomol. Ver. Apollo, N.F. 14 (4): 371-384, Jan. 1994.